Ultrasound- what is it, and why could my pet benefit? For almost as long as I can remember, I knew that my calling was to help animals. Growing up in upstate New York, I watched (and sometimes assisted) my mom, who volunteered as a wildlife rehabilitator. I was amazed by the wide variety of animals she would nurse back to health before watching them return to their natural habitat. Although wildlife rehabilitation is a very worthwhile avocation, I needed something more. The human-animal bond was something that was important in my life, and I knew that my calling was to not just to help animals, but to help strengthen the human-animal bond between pets and their owners. Through the years since my graduation from veterinary school, I’ve seen incredible changes in technology that help veterinarians diagnose illness and disease. The technology may have changed, but the reason I practice veterinary medicine remains the same- I want to help extend the human-animal bond, and extend the quality of life you share with your pets. New technologies are helping me do just that. For several years now, Tampa Veterinary Hospital has been an early adapter of some of these new technologies. We invested in full-body digital x-ray, digital dental x-ray, class IV cold therapy laser, in-house lab machines and ultrasound to name a few. These tools are vital for us to help diagnose- or rule out- issues within your pets. Although we’ve had ultrasound for quite some time, I’m excited to announce that we have made an investment in a new, state-of-the-art ultrasound system, as well as in-depth training for senior team members to perform ultrasound examinations for a variety of conditions. There are many reasons we chose to make this investment. First and foremost, we know it is often inconvenient when we need to refer you to a specialist for an ultrasound appointment. Providing ultrasound in our hospital saves you both time and money, and allows for a quicker diagnosis of your pet’s condition. But what is ultrasound, and how does it work? You’re probably already familiar with the technology, if you have children, or know someone who is expecting a child. The prenatal ultrasound is a common procedure used to routinely check on the development of a fetus in the womb, as well as to identify if the baby is a boy or a girl. This is just one example commonly used in human medicine. Simply put, the ultrasound machine uses sound waves produced by a hand-held wand- called a transducer. These sound waves travel into your pet, then back to the wand. The machine interprets the echoes of the sound waves and produces a picture on a specialized monitor. These images are then reviewed by a certified veterinary radiologist to assist us with a diagnosis. Who performs the ultrasound exam? At TVH, we have two certified ultrasound technicians to perform exams. Depending on the exam being performed, one of our technicians may transmit the ultrasound images liveto a Board Certified Radiologist who is viewing the ultrasound in real-time. The Radiologist may help guide our certified technician to ensure the best images for an accurate diagnosis. Can’t an x-ray show you the same thing? Generally speaking, not really. Ultrasound provides a much better view of soft tissue (your pet’s organs) while x-rays provides a better picture of hard tissue (bones). 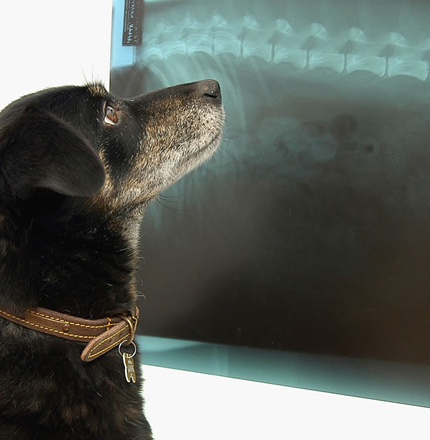 X-rays can show us shadows of soft tissue and if there may be problems worth investigating in a particular organ. Sometimes, an x-ray is used in conjunction with an ultrasound so we have a greater understanding of the whole picture. 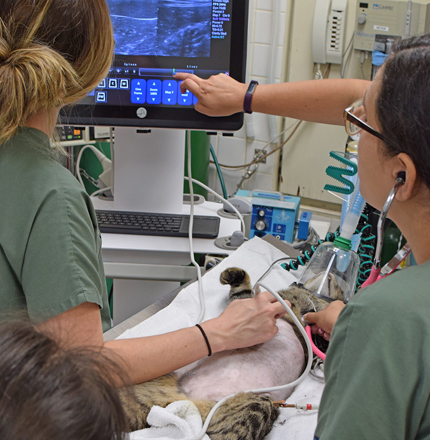 Each ultrasound examination is a little different, depending on your pet’s condition and which organs we intend to focus on. But you need to know that your pet’s abdomen (or portions of) will be shaved. Since the ultrasound uses sound waves, clean contact must exist between the transducer and your pet’s skin. Despite the technology, sound waves do not penetrate well through hair. Of course, your pet’s hair will grow back within a matter of weeks. Your pet will be sedated orput under general anesthesia for the procedure. Although the ultrasound is painless, your pet needs to be motionless while lying on their back for an extended period of time, usually not lasting more than 45 minutes to 1 hour. If the ultrasound identifies a mass or potential tumor, we may wish to do an ultrasound-guided aspirate. In this procedure, we use the ultrasound to help us guide a small needle into the tumor to remove a sample so it may be analyzed by an off-site laboratory. These results are available usually within one week. Of course, this is just one of the many diagnostic tools we can use to confirm normal or identify problems with your pet. If we feel that an ultrasound will assist us in providing you and your pet with a diagnosis, we will recommend the procedure, as well as alternatives- so we can fulfill our goal of extending life and the bond you have with your pet.